This little green cottage is a real artist stopper. No artist can walk by this cottage and not hear it say,”paint me, paint me!”. 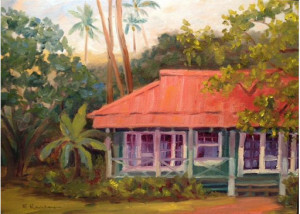 This beautiful Cottage is found at the Waimea Plantation Cottages on the west side of Kauai. There are a selection of restored cottages sprinkled through out this beachfront property with a pool and restaurant and mature landscaping. this is a popular wedding destination.